The Camaro and Firebird share many of the same drivetrain components, particularly the rear axle assembly. As previously noted, transmission choices were minimal. The Firebirds were either equipped with an automatic or 4-speed manual transmission. The rear axle ratios varied depending on engine, transmission, and even sometimes because of options. The drivetrains were durable for the most part. There may be a difference of opinion on the 301 engines as far as their reliability and durability. Over its model run, the second-generation Firebird was equipped with the 8.5-inch corporate 10-bolt and corporate 12-bolt differential. You can rebuild your rear differential at home, but it requires some specialized tools. These technically complex parts require precise tolerances and expensive tools to properly rebuild. Warranties are available from most shops that perform the work. Whenever the transmissions and rear axles need attention, have an expert rebuild them. In my opinion, some things are just worth paying for. 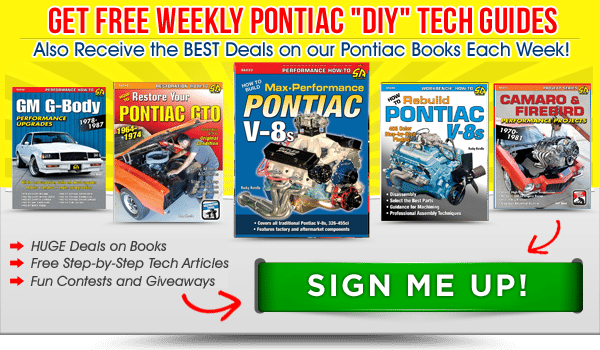 However, if you really want to work on the differential yourself, Jefferson Bryant’s Chevy Differentials: How to Rebuild the 10- and 12-Bolt is an excellent guide with lots of detailed information and step-by-step instructions. For your Firebird to stop without stalling the engine, it needs a way to disconnect from the engine. A clutch is needed because the wheels are not always turning when the engine is turning. The clutch allows a smooth engagement of the engine to thetransmission by controlling the slippage between them. A clutch works based on friction between the clutch plate and the flywheel. When the pedal is not depressed, the springs in the pressure plate apply force against the clutch disc, which then applies pressure on the flywheel. This mates the engine to the transmission, making them spin at the same speed. 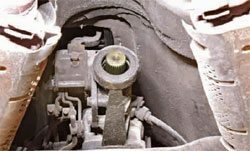 When the clutch pedal is depressed, the clutch linkage moves the clutch fork, which moves the throwout bearing against the diaphragm spring. As the spring is pushed inward, it causes the spring to pull the pressure plate away from the clutch disc. This disconnects the clutch from the engine. 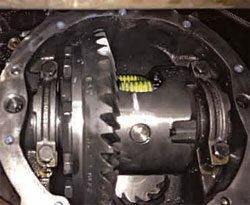 If you hear a noise at idle and it goes away when the clutch pedal is depressed, the problem is most likely between the clutch fork and pivot ball. Set the parking brake, put the car in neutral, and start the engine. With the Firebird running, listen for a low-pitched noise. If you hear a noise, the issue may be in the transmission. The corporate 10-bolt rear axle was the mainstay of the second-generation Firebird. It was a robust axle assembly and the available axle ratios varied widely throughout its 11-year run. 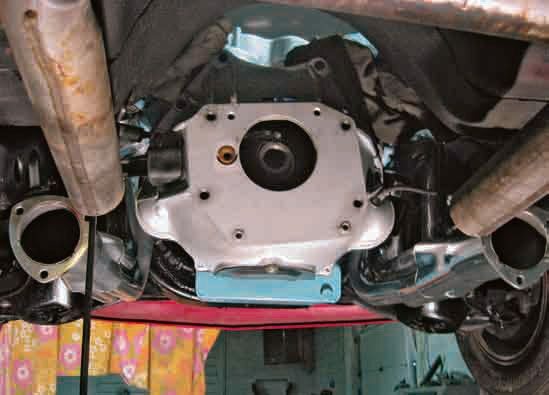 The clutch and pressure plate in a manual-transmission Firebird connects the engine and the transmission. The bellhousing and clutch are installed along with ceramiccoated headers. The lockout rod is dangling on the left. 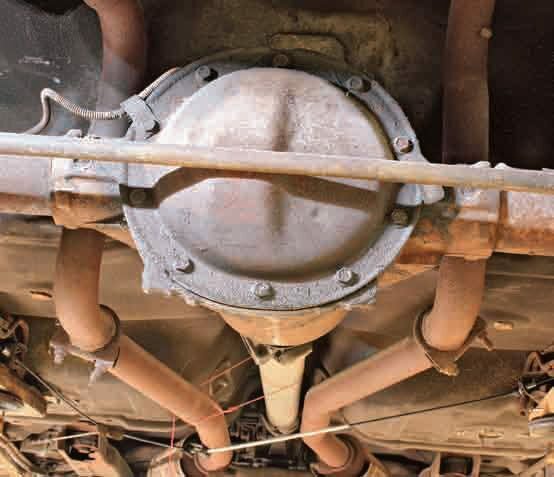 The driveshaft is one heavy piece of steel, so take the necessary safety precautions when removing it from the car. Slowly push in the clutch pedal while listening for an irregular noise such as a higher-pitched rubbing noise. The noise may sound in rhythm with the engine. If so, you may have a throwout bearing issue. If you depress the clutch pedal all the way to the floor and hear a squealing noise, you may have a defective pilot bearing or bushing. If you do not hear noise while performing these techniques, your clutch is probably not the problem. You could expect to get around 50,000 miles on a clutch. That, of course, depends on how you drive the car. Moreover, habitually driving with your left foot resting on the clutch pedal significantly reduces clutch life. 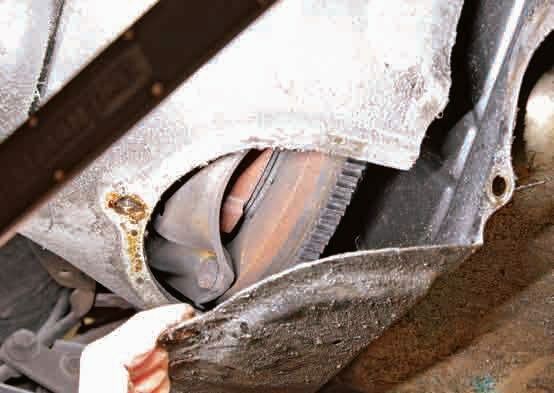 Checking and keeping the clutch in adjustment also is critical. Self-adjusting or hydraulic clutches are not available in second-generation Firebirds. The friction material on the disc wears out much like a disc brake pad wears and will require adjustment and then replacement when it wears out. 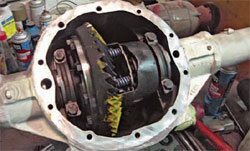 Clutch slippage that is not correctable by adjustment is one of the most common signs that it’s time to replace the clutch disk. Two small bolts at the end of the shaft hold in each side of the U-joint at the rear axle yoke. These bolts have often been subjected to years of corrosion. 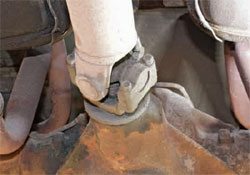 If the differential seal has been loosened or cracked, the U-joint often has oil or grease in it. In addition, moisture and road debris can cover the U-joint, so these U-joint strap bolts are often frozen in place. First, soak them with WD-40 or PB Blaster; in extreme cases, you may need to use a propane torch. A ratchet and socket are typically used to remove the bolts and the small straps that hold the U-joint to the yoke. If the bolts are particularly stubborn, use a breaker bar or an impact wrench. Once the bolts have been removed, place a pry bar between the yoke and driveshaft. 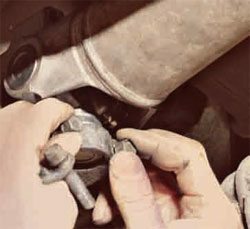 Gently push the driveshaft away from the yoke to break the U-joint free from the yoke. 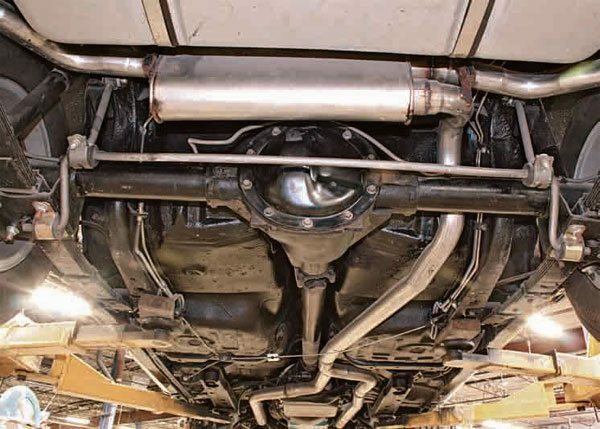 Once the driveshaft has been separated from the rear axle yoke, gently pull the driveshaft out of the yoke in the tail section of the transmission. The driveshaft is a heavy piece of steel, so be prepared to carry it to your workbench or storage area. 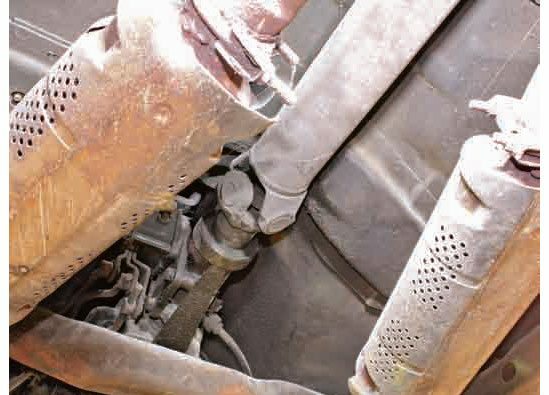 Lay the driveshaft on the floor and visually inspect it for any dents or irregularities. Check the welds at each end of the yoke on the shaft for any cracking. 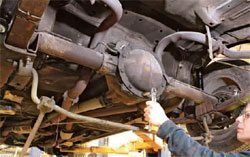 If you find any missing weights or damage to the driveshaft, I recommend sending it to a driveshaft shop to be repaired and balanced. Place the driveshaft in a vise and remove the C-clip on the inner side of the yoke that holds the U-joint in place. Two C-clips reside at the rear of the driveshaft ears; four are at the front. The clips are held in by pressure and in a recessed area of the yoke. Once the C-clips have been removed, the U-joint is loose, and you need to prepare for the next step of pressing out the U-joint. 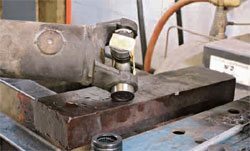 Because many car owners do not have a hydraulic press in their home workshop, they take the driveshaft to a machine shop to have the U-joint pressed out of the fixed yoke. 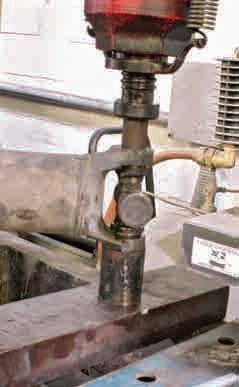 If you have a hydraulic press, place a pipe end large enough for the U-joint cap to slide through on the driveshaft. On the press end, align a socket or other round object that’s about the same diameter as the U-joint. As the press applies force to the U-joint, it pushes the U-joint cap through the yoke. Make sure everything is perfectly straight. Once you have removed the U-joint, inspect the yoke ears for any distortion or cracks. Cracks can occur anywhere on the yoke ears. 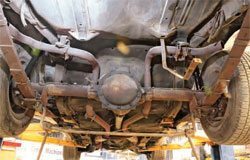 They can also occur at the welds where the yoke is attached to the driveshaft tube. 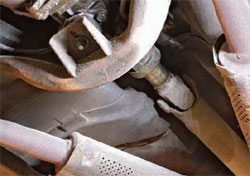 U-joints on a high-mileage car have often reached the end of their service life and replacing them is relatively inexpensive. 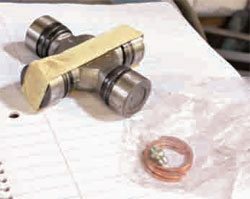 Organize the U-joints and get them ready for installation. Remove the new U-joint from the box and tape the caps on to prevent them from falling off. Small needle bearings sit inside the cap, and it’s critical that the needle bearings stay in place. Place the U-joint in the yoke on the shaft. Gently remove one of the caps that has not been taped. Place the shaft and cap back into the hydraulic press. Place the cap that you removed onto the outer end of the shaft and then press it onto the U-joint so that the two caps are pressed into the shaft yoke. Remove the shaft from the press. Install the zerk fitting into the U-joint. This is best done with a small open-end wrench. Install the C-clips onto the U-joint. These clips simply snap on and do not require tools. If you have difficulty, you can use small needle-nose pliers. The front yoke and U-joint are exactly the same as the rear. 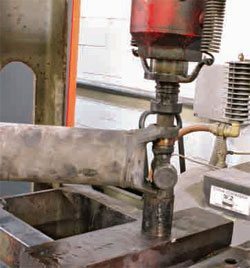 This process requires an extra step on a hydraulic press because all four sides must be pressed out. This is the tailshaft housing of the transmission and the splined output shaft. Slide the forward yoke over the transmission output shaft. Place the other end of the driveshaft into the rear axle yoke. Slide the shaft forward enough to clear the axle yoke ears and then pull it back slightly to seat the U-joint into the seat of the rear yoke. With the U-joint resting in place against the yoke, place the U-joint straps over the U-joint and thread in the bolts. Clean the U-joint straps and bolts before reassembly. This helps establish proper torque because no dirt is in the way. The bolts must have clean threads so they can be torqued to the proper rating. Once you have the straps installed, leave one bolt out for access to the zerk fitting. 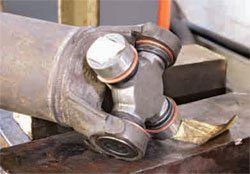 You do not want to grease the U-joint before it is installed because the grease pushes the caps off the U-joint. If you experience a vibration after installation and you did not feel one before, remove the driveshaft, turn it one-half turn, and reinstall it. Sometimes that cures the issue. If not, recheck your work. Otherwise, the shaft must be balanced at a driveshaft shop. Most manufacturers recommend NLGI Grade-2 grease with an EP additive (EP additives are meant for shock loads and frequent load/unload cycles such those of a universal joint). One such grease is Chevron Ultra-Duty EP2. Slowly add the grease until you see some ooze out. Make sure you do this slowly because too much grease is not a good thing. Inspection of the driveshaft requires you to visually look at every square inch of it for any dents or dings. Also watch for any evidence of missing weights. If the Firebird was running and driving and there were not any vibration issues, then new U-joints are probably all that is required. If there are any visible issues or a vibration, then it is better to send the shaft to a driveshaft specialty company. A specialist can balance the tube or make a new one to fit and function as new, usually for less than $300. The stock driveshaft is more than robust and is able to handle much higher horsepower and torque than the factory ever offered. 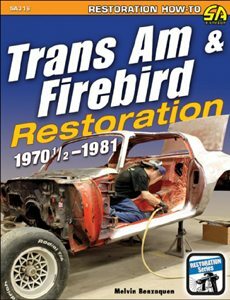 The 10- and 12-bolt rear axles that were installed in the Firebird are a similar design, and therefore, rebuilding the 10- and 12-bolt follows a similar procedure. 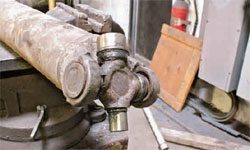 Overhauling the rear axle is a long and methodical process, and it requires specialized tools and knowledge. Getting a rear axle to be free of noise on acceleration and coast takes skill in it setting up. The 12-bolt axle was only used for the 1970 model year. A popular upgrade from the stock 10-bolt setup is to use a 12-bolt. Moser Engineering and Currie Enterprises both offer bolt-in 12-bolt rear axle packages with a variety of ratios available. 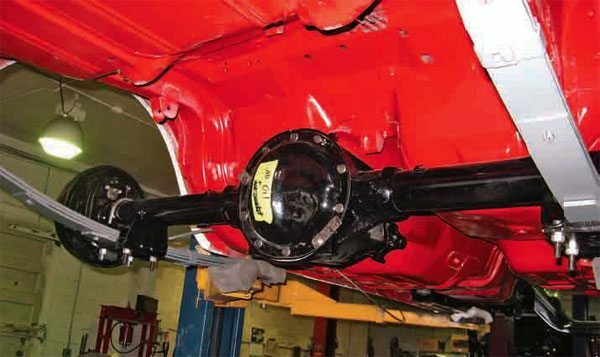 These complete, ready-to-install rear axle assemblies can run about $3,200, depending on the options you choose. Owners typically want to know the gear ratio of their differential. You can simply drop the rear cover and count the teeth on the pinion and on the ring. Then, divide the number of ring teeth by the number of gear teeth. That is the gear ratio. Another, albeit slightly less accurate, way to tell which ratio your Firebird has involves little more than raising the rear tires off the ground. Block the front wheels and raise the rear wheels with a floor jack. Use tape or a grease pencil to mark the tire and the wheel well opening. 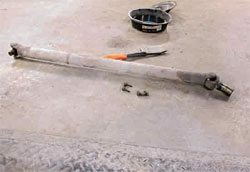 Make a mark on the driveshaft with tape or a grease pencil. Turn the tire and count the number of times the driveshaft turns to one single revolution of the tire. For example, if the shaft turns about 3.5 times to one revolution of the tire, the rear is about a 3.55 ratio. Given that the 3.55 ratio was not available in the Firebird, it most likely is a 3.42 ratio. The difference could be in the tire size or just a slight difference in turning ratio. If a rear is not set up perfectly, you will have problems. Even the setup for the ring and pinion-to-ring gear mesh is absolutely critical. At a minimum there is noise on the acceleration or coast side if not perfectly set up. 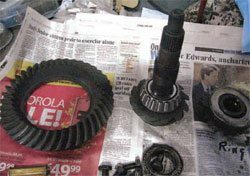 An improperly set up rear that has been run can ruin the ring gear and pinion, which will require a complete replacement and you’ll have to start over from scratch. 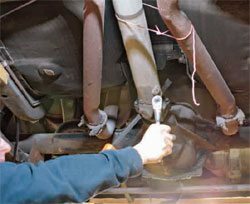 Gaining access to the differential and to change the oil is a relatively simple process even with the sway bar in place, but in this case, you remove the sway bar. As I have said before, there are some things that are worth paying for to have done properly. Even if you are performing the rest of the restoration on your car yourself you can remove the rear axle housing and deliver it to the shop for the rebuild. Remove the upper sway bar links at their uppermost mounts using a socket and ratchet with an extension for the upper links. A socket and ratchet work fine for the end mounts. 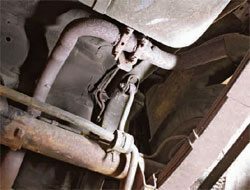 Once the links have been disconnected, the sway bar can swivel out of the way. Most of the time the cover gasket has leaked. Although the bolts may be difficult to turn initially, these bolts should not be frozen. Using a socket and ratchet, remove the 10 or 12 bolts holding on the cover. Once all of the bolts have been removed from the center section cover, it often has to be pried off. 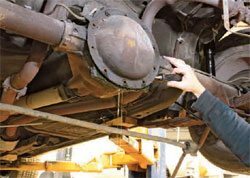 If you have ever smelled used differential fluid, you know how bad it smells, and if you get it on your clothes, you probably won’t get the smell out. Use a small pry bar or flat-head screwdriver to pry off the cover; be sure to break the seal all around the mounting surface of the cover. If the cover is particularly difficult, use a plastic mallet to tap the cover. Be sure to place a drain pan underneath to catch the oil. Let the oil drain before completely removing the cover. It is best to start prying at the bottom to allow the housing to drain before letting the entire cover come off. It can make a big mess if you just pop the cover off all at once. Once the oil has mostly drained, remove the cover. Then you can see the ring rear, side gears, and spider gears. If catastrophic failure has occurred, you should be able to see evidence of it. In this particular car, the gears and components appear to be in good condition. The ring and pinion is removed from the axle. You can rebuild the axle assembly in the car or on the bench; the decision is up to you. However, if the rear axle has never been rebuilt and needs all new seals and bearings, it easier to rebuild on the bench. When you have completed the rebuild, the carrier is placed in the center section. You can tell that this is a limited-slip unit because of the clutch pack at the top. This is a newly assembled differential. The yellow grease on the gears is a way to see how the pinion and ring gear mesh together. The ring and pinion should mesh in the middle of the ring gear. The ring and pinion should not mesh too much on the coast or toe side; they should mesh in the middle of the ring gear. Second-generation Firebirds used the corporate 10- and 12-bolt axle assemblies. This 10-bolt has been re-installed in this Firebird.